Hey ladies and gentlemen . Sorry I haven't reviewed a beer in quite some time , but I had a huge project due and just finished it last night , so I celebrated with this beer as a night cap, and this is a beer I've been kinda wanting to try . It's rather affordable for a barrel aged beer , and I have heard some great reviews on this wee heavy style beer . 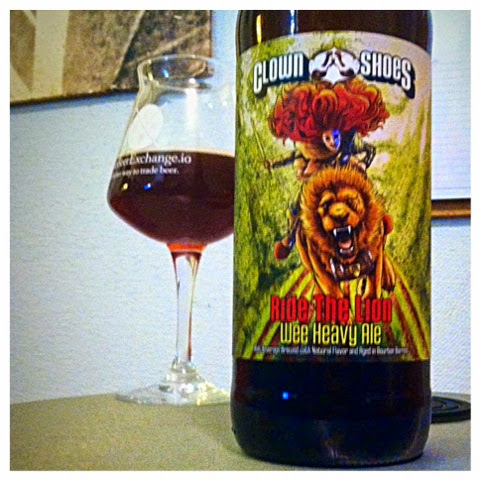 So let's get this poured into a glass , and find out what it means to "Ride the Lion." Pour : A murky mahogany color , looking almost a light dark ruby red almost brown color . It looks like a really nice scotch ale . Very little lacing to this one , dissipating rather quickly. Alcohol legs are strong on this one . I can tell this is going to be a great beer just by the appearance . I'm kinda quick to judge , but I know a good beer when I see one . Aroma: A very nice smell of bourbon, followed immediately by toffee , dark fruit , bourbon soaked plum , raisin, and vanilla . I also get candied root beer , sugar coated almonds too. It smells amazing . Taste : This is really good . A solid amount of caramel flavor along with bourbon . No heat at all from the barrel , it's smoothed so well with the flavors of the wee heavy , that it makes the beer dangerously drinkable at 11% . Lots of toffee , oak , a little bit of a rye note , and lots of sugared dark fruits. A very nice medium bodied Wee Heavy . Heavy and I recommend the pick up and age it for a good year or so to bring in more barrel flavors . Cheers !